For the people who are especially hard to buy for each Christmas, I always think a lifestyle themed gift can never go too far amiss. Items for the home and day to day items are suitable for most people and are always easy to get hold of, even in the lead up to Christmas when people have gone into panic buying mode. I've gathered together a bunch of pieces from the high street and online, all priced to suit any budget and most importantly, all still available to order for Christmas delivery. 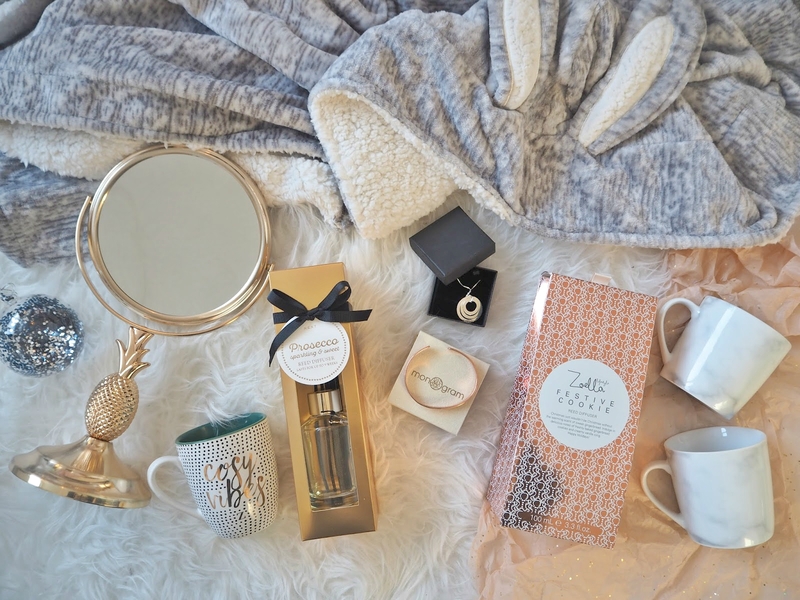 Possibly my favourite item in this gift guide is the unbelievably soft, warm and snuggly Next Bunny Robe, which ticks all of the boxes for a perfect gift this year. I think a dressing gown is a present that a lot of people expect (and hope) to receive each Christmas, and this has to be one of the nicest I've seen. The grey and white colour is suited to anyone's taste, the bunny ears on the hood make it cute without it being overly gimmicky and as I've mentioned, it's just so lovely to touch. I'm sure anyone would be happy to receive this... I've been living in mine! 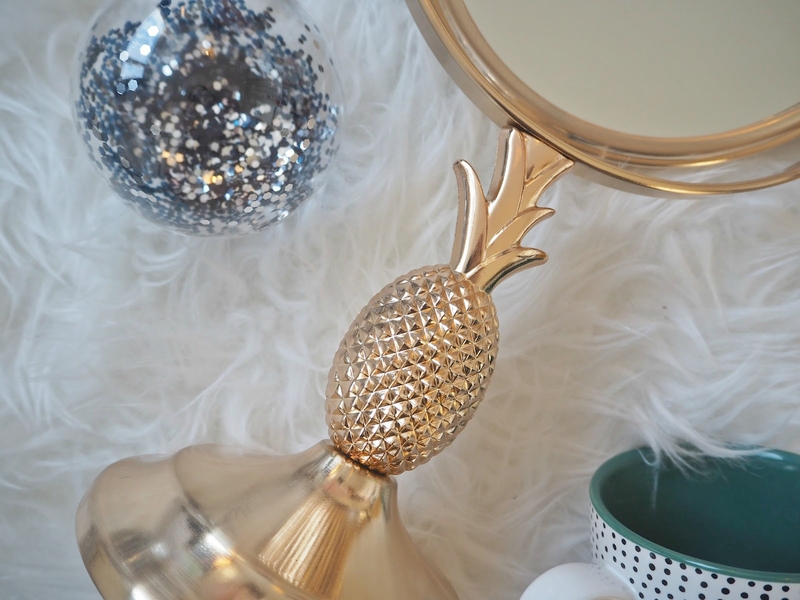 A gorgeous gift for a woman or teenage girl is this stunning, gold pineapple mirror, which believe it or not, is an absolute steal from Argos! Not only does it look great with the brushed gold metal finish, but it's really practical too... One side is a regular mirror and the other magnifies the reflection five times, to give a really close, clear view, perfect for applying makeup or plucking your brows. I have added mine to my dressing table, and it looks so luxurious... You'd never expect to get a piece like this for under £30. 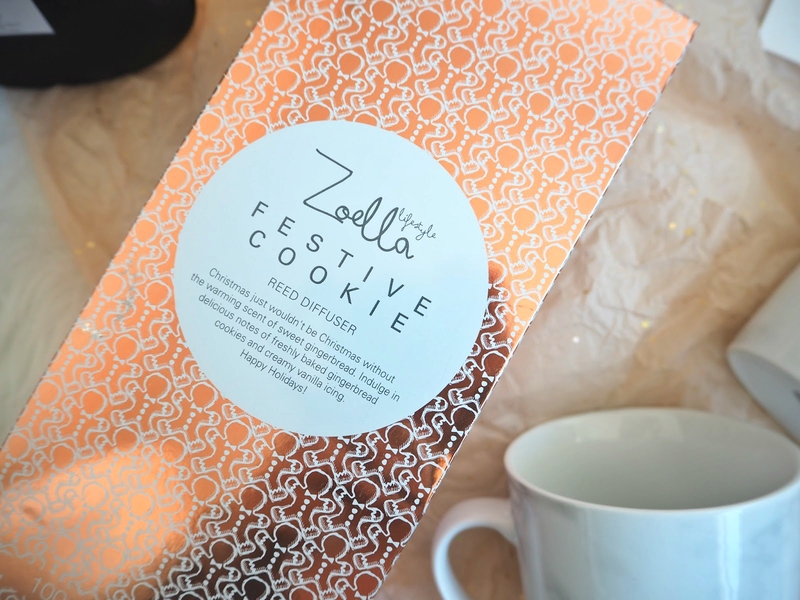 As someone who receives candles every year, I think that the idea of a reed diffuser is a little more exciting, and I am loving the Zoella Lifestyle Festive Cookie offering. This is one of those scents that immediately reminds you of Christmas... it's very sweet with a mixture of ginger and vanilla notes, it's almost good enough to eat. I do love the packaging too, my only gripe is that the actual diffuser bottle is a bit plain and boring... To look at, I do prefer the candle version of the scent. Personally I would love to receive these beautiful porcelain marble mugs from Next. They come in a pack of four, for only £14, which seems like a real bargain, and an ideal gift for any new home owner or couple. I love how simplistic they are and their small yet chunky shape is really modern and exactly to my taste. Of course marble isn't everyone's favourite, but if I'm speaking for myself and another hundred thousand blogger type girls then most of us are obsessed! Nothing is more thoughtful than a personalised gift, and if you really want to show someone you love them this Christmas, a piece of personalised jewellery has to be top of your shopping list. Onecklace offers endless options of design, colour, size and style, which you can personalise exactly how you wish. I love the dainty name necklace which I have in silver and the contrasting chunky rose gold style bangle which I had embossed with Elodie's name and date of birth. 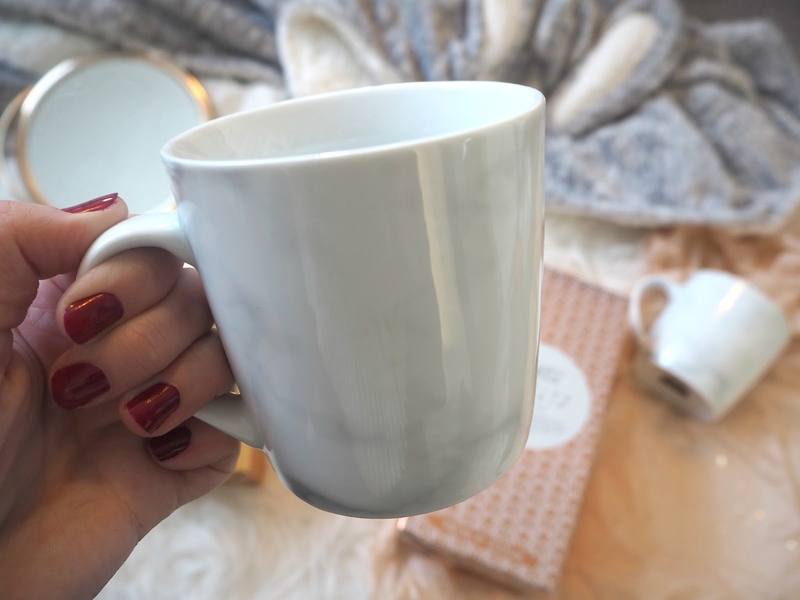 The Zoella Cosy Vibes Mug is a cute little extra present for a stocking filler on Christmas morning. It's cute, it's quirky and the perfect size for a hot chocolate - Any Zoe fan will love it... In fact, it's my favourite thing from her lifestyle range this season, and I'm well out of her target audience age range! The full range is also currently included in the Boots 3 for 2 offer, so it's perfect timing to grab yourself some gifts. And last but not least, another diffuser, I know, but this is so different as it's aimed at an older audience, and it's prosecco scented, YES... Prosecco! If I haven't sold this to you already, it comes boxed in gold with a decorative navy bow to add the finishing touch and make everything look that little more luxe. 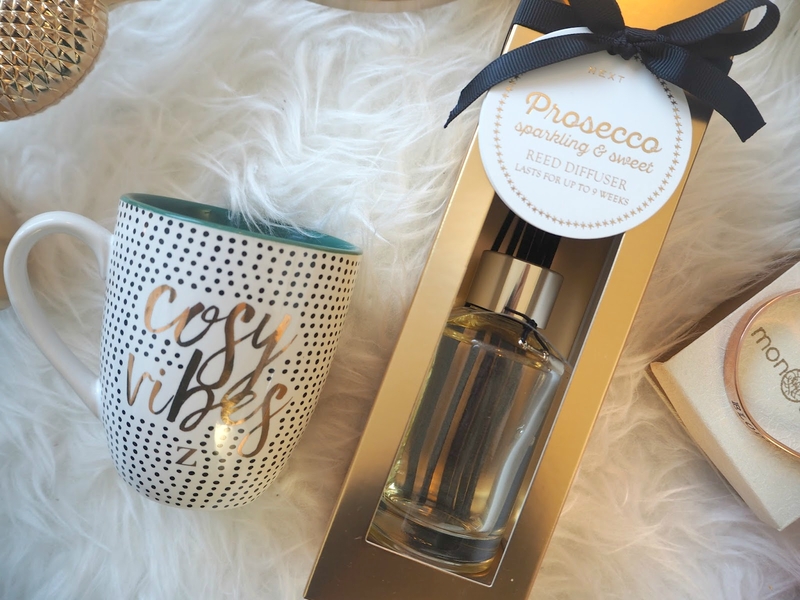 The bottle itself is really sleek, finished with a little prosecco bottle charm and would sit beautifully on any dressing table or sideboard without looking out of place. If prosecco isn't your thing, Next also have the option of Gin and Mulled Wine scented diffusers in their Christmas range too. How are you getting on with your Christmas shopping? Leave links to your gift guides in the comments too, I'd love to have a read.